Reading the devastating expose on Richard Blumenthal in the New York Times today, I was as amazed as everyone else. I became even more amazed when I ran his name and a couple of relevant keywords through the Google News Archive. The Times reported: "In at least eight newspaper articles published in Connecticut from 2003 to 2009, he is described as having served in Vietnam." At a time when American youths were burning draft cards, Blumenthal enlisted in the Marine Corps Reserves. He said he enlisted because he had a "pretty low draft number." 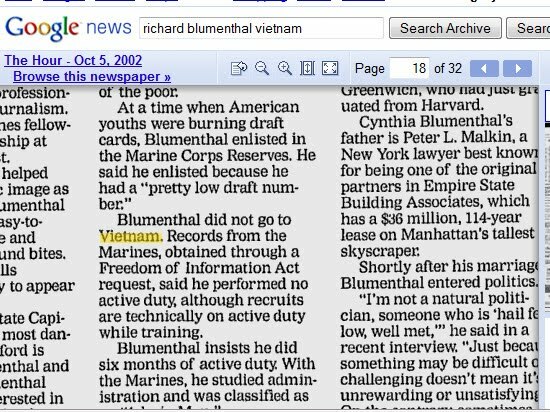 Blumenthal did not go to Vietnam. Records from the Marines, obtained from a Freedom of Information Act request, said that he served no active duty, although recruits are technically on active duty while training. Blumental insists he did six months on active duty. With the Marines, he studied administration and was classified as an "Admin Man." Note what I put in boldface. In the news biz, we call this "old news." 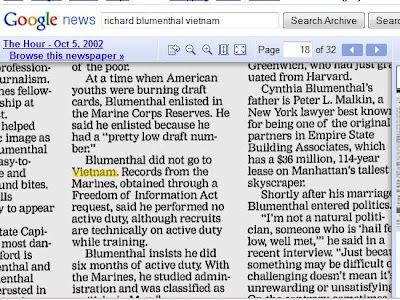 Obviously, back in 2002, Blumenthal wasn't trying to hide anything. Nor does this excuse any of Blumenthal's subsequent lies; all it does is make them seem weirder. After all, all the facts were already out there, and thanks to the AP they were on Nexis. How could Blumenthal have expected to get away with it? But I'm nonplussed by The Times's behavior here. Rather than picking up on this frank admission and the AP's ancient FOI request, it trots out instead a timeline showing his draft number and so on, which I guess is more impressive than an on-the-record quote in the AP eight years ago. The Times should have at least mentioned this article. By the way, note that it was published on the Hour's obituary page. Since the Times article was in the nature of a political obituary, placement there might have been warranted too. Amazing, isn't it, that the Democrats may lose a seat in the Senate over this kind of stupidity? OK, the Times focused on the lies, not the truth-telling, and this is still a scoop that is probably going to get Blumenthal pushed out of the race. Even so, I find it weird that the AP story from 2002 wasn't mentioned in the Times. It makes the story even more interesting. I assume the reporter knew about it. Or did he?